It’s beautiful here in Florida this time of year. It beckons us to go outside and spend time enjoying the balmy weather. I always feel better after a walk through the trees and suburban forests of my neighborhood. It just feels good to be out in nature. Why is that? Somehow my mind is easier to quiet. It’s as if it gets decluttered! Our minds can get as cluttered as our lives and downsizing some of those incessant thoughts is a good idea. We all get caught up in our heads, distracted by worry or fear and that results in our not being present in the right here, right now world. Another way of saying that is that we are not clear-headed. Mental clutter pulls us off center and disrupts our balance in a way that can get so mish-mashed that we end up lost in our own world… and it can feel like la-la land. The thing is, la-la land can feel like cognitive decline when, in point of fact, your mind is simply too cluttered to be aware of what is right in front of you. How often do you have a conversation with someone and have no idea what they said? How often do you want to leave and can’t find your keys/wallet/purse/glasses? And you begin to think you’re losing your mind when the truth is that you simply are not paying attention to your own actions. The keys are under the mail or with the jacket or in the refrigerator. That’s not cognitive decline. 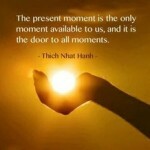 That is not being present; not being mindful of your actions. Decluttering your mind allows an acute awareness of the here and now. 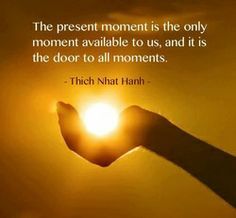 It allows you to reconnect with the present moment. And it is in the present moment that all human connection occurs. It is in the present moment that we can hear, see, smell and taste. There is no yesterday. It is only a memory. There is no tomorrow. Once tomorrow comes, it’s today! Tomorrow is merely a dream or an expectation. So how do you declutter your mind? It is an act that requires you to be intentional on where you place your attention and impacts how you spend your time and energy. Too often we do things out of habit. It’s mindless. And the point here is to be mindful. What do they say, “Stop and smell the roses”? When is the last time you admired a flower or a spectacular Florida sunset? When is the last time you took a walk in nature – at a park, the beach? When is the last time you sat in a chair and just looked and listened to the sounds around you? Be a Savvy Senior. Be mindful of what’s around you. Being present means you consciously choose your thoughts. Taking a walk in nature. Concentrating on the colors, textures, smells and sounds around you is more than just relaxing… it’s restorative. Breathe. Look. Listen. Repeat. Great article about mindful awareness. For me, this practice has helped to bring myself back from mindlessness to mindfulness and over the years, has rewired my brain. I think I am more focussed and sharper than I was 10 years ago. You are doing a great service to all of us by teaching this in The Art of Living Longer workshops. Thank you.